Ascending Butterfly: Friday, January 15, 2010 - Today's Words of Inspiration and great giveaways! Friday, January 15, 2010 - Today's Words of Inspiration and great giveaways! 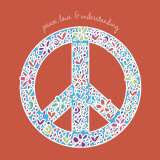 Ƹ̵̡Ӝ̵̨̄Ʒ - At Ascending Butterfly we are all about Peace (especially inner peace), Love and Understanding! I love finding ways to literally 'wear my message', and fashion accessories are a great way to do it! Introducing the sakroots Artist Circle Weekender, featuring artwork from artists who share in our hope of cultivating peace and harmony...and the best part? They are eco-friendly (The Exterior is 50% recycled Nylon and the interior is made out of 100% Recycled Cotton). And in keeping with our theme of 'shopping with purpose', proceeds go to support The Nature Conservancy's Plant a Billion Trees Campaign! We affirm positive messages everyday, and I love how this bag has words like 'Peace', 'Happy & Free' and 'Nature' written on it. Nature has a played a very strong role in our threads this week, I hope you have taken some time to get out in it. This weekender would certainly provide a good reason to indulge your wanderlust, and best still, it's on sale! Originally priced at $99, it is on sale right now for $69.50! And with proceeds going to support The Nature Conservancy's Plant a Billion Trees Campaign, it is virtually 'Guilt-Free Shopping'. Continue to let Nature speak to you and inspire you this week! I have, and I've really enjoyed what I've been learning! Great bag. Hope I can snag one on sale. It is worth every penny for the regular price also. People dont understand how important it is to promote peace and how important trees are in the world. I had an idea a while about writing a book called the last tree. It is about the last tree on earth that is protected under a glass biodome and how scientest are working to make more trees to support the planet. Of course you know there is a bad guy in the story who tries to stop them and rule the world. I just dont have all of the details worked out yet. I really like your blog! It is very informative with a wide variety of interests for different clicks of people. Following from MBC!